Cars that burn gasoline and trucks that burn diesel go together with oil pipelines like a bow goes together with an arrow; without one the other is unnecessary or useless. How can you get rid of the oil if you don’t do anything about the very thing that gives oil its demand? This is an economics website and the dependency of oil and internal combustion engines is economics 101. I’m compelled to write about this issue again and again to call out my fellow environmentalists as absurd to protest oil pipelines without investing at least an equal amount of their time in supporting hydrogen fuel cell vehicles & the fueling infrastructure to support them. You cannot get rid of oil pipelines without getting rid of internal combustion engines. We environmentalist types want to stop the use of oil for several good reasons: it will create American jobs, it will eliminate underground storage tanks that are the #1 source of water contamination by petroleum, it will stop billions of dollars in annual military spending in hostile countries to protect oil infrastructure & maritime delivery routes, it will reduce the risk of expensive & irreversible spill damage, & cetera… the list goes on and on. Most environmentalists, however, are doing it wrong in my opinion with their militant oil pipeline protests; the logic is backwards and counterproductive to the stated goal. People don’t understand that the person they see in the mirror and share a cup of coffee with are the very reason for the oil pipeline’s existence; it’s a paradox. My frustration with oil pipeline protesting is nearing the same level as the pipeline protestors’ frustrations with the pipeline builders. The question that cannot be escaped is this: how can you have transportation without oil? Battery electric vehicles can help in some markets now, but they cannot solve the problem completely without help from hydrogen fuel cells. And, as long as we don’t adopt fuel cell electric vehicles, oil pipeline protesting is a fool’s errand and waste of time. No disrespect to well-meaning people, but do you really want to stop the use of oil? You certainly must acknowledge the paradox and admit that you’re complicit with the reason we have oil pipelines before you can make any real progress, right? You cannot drive your ICE vehicle to an oil pipeline protest and expect to be taken seriously, right? 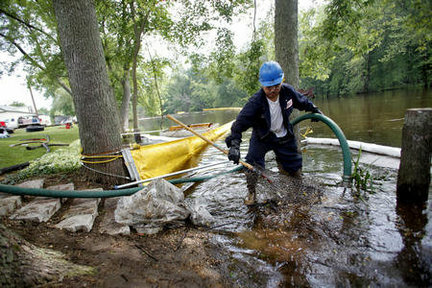 A man works to clean oil from the Kalamazoo River after Enbridge’s Line 6B ruptured and caused the largest inland oil spill in American history. Oil pipelines like 6B will continue to exist as long as we use vehicles with internal combustion engines, regardless of oil pipeline protests. I can understand certain oil pipeline protests like the #ShutDownLine5 movement and I know the folks at Kent County Water Conservation & FLOW that are working so hard on that particular circumstance as it is uniquely different because Line 5 crosses the Straits of Mackinac and runs along the entire shoreline of the Upper Peninsula so close to Lake Superior. It’s obscene that the #Line5 oil pipeline is past it’s useful life expectancy, not up to code, not in compliance with its original promises, and could continue to be operated in such a perilous place even as we all depend on oil for our way of life. #Line5 should be shut down now. The holistic point of this post, however, is to see all oil pipelines shut down. This post isn’t really about singling out #ShutDownLine5 or #KeystoneXL or #DAPL. This post is about the collective retirement of every single major crude oil pipeline for the betterment of society and our economy. All oil pipelines & underground storage tanks are bad news for our economy as they threaten water everywhere and cause import/export deficits. But does stopping a certain pipeline stop the flow of oil? The answer is no. The oil is going to move across the Great Lakes, our streams, rivers, & wetlands regardless of whether an oil pipeline protest is successful. In fact, statistically speaking, oil transport by any means other than pipeline is at a higher risk of contaminating water. Think about that one for a moment. What we really must stop is the use of oil. If we stop the use of oil the pipelines, oil train cars, oil & gasoline semi haulers, oil tank farms, and underground storage tanks will disappear of their own accord. I pray that this concept makes sense to someone else in Michigan and you help support RMP as we lobby to get support to build Michigan’s first public hydrogen fueling station to make a statement and join other world leading cities like Los Angeles, San Franscisco, London, Paris, Hamburg, Aberdeen, Tokyo, and Berlin. Why isn’t Detroit in that list? Where are my people? RMP has only 150 facebook likes? Come on, you really want to stop oil? Join RMP, follow us, make a tax deductible donation to our tiny 501(c)3 organization and help us grow and show the way. Help RMP grow and we will show the way to prosperity, clean air, and clean water. 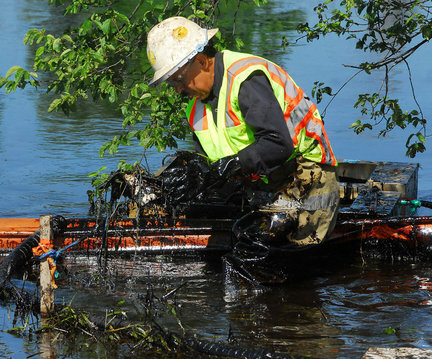 Another pic from the Enbridge Line 6B oil spill into the Kalamazoo River. Are you angered by oil pipelines? Protesting them will not stop the flow of oil. Sorry to be the bearer of a hard truth. I don’t attend these oil pipeline protests and I doubt I ever will. I have, however, seen the people that go on TV and have even reached out to work with many of the other environment orgs in Michigan like Michigan’s Sierra Club. Michigan’s Sierra Club chapter even gave me an award in 2013. I don’t understand why groups like Michigan’s Sierra Club, however, are protesting oil pipelines and not supporting hydrogen fuel cell vehicles. I imagine that protesting must make them feel good, help them bring in bigger donations, or maybe they erroneously think they’re doing something good for mother earth. I’m sorry to say, however, they’re not helping end the use of oil with protests. The oil will flow either way even if an oil pipeline protest is successful. You can play your guitar, sit around your campfire, sing Kumbaya, and all that other stuff while protesting oil pipelines but you won’t stop the oil. In fact, the protest attendees probably drove oil powered cars to get to the protest, have a propane heaters to keep themselves warm during the protest, and sleep in a sleeping bags filled with polyfill and a hundred other oil based products. Do you see the irony I’m bringing? So are you getting mad at me yet? Are you asking me yet: how do you solve it then smart guy? Please read on. This website is my weblog of many posts on how to responsibly migrate away from the use of crude oil for energy. We can stop the use of oil for the betterment of our economy and to create American jobs without attending a single oil pipeline protest. Every post here for years now is dedicated to this simple mission. Look, it’s not going to be easy, but nothing worth doing ever is. It’s going to take years & decades. But people have to start focusing on doing something positive, set some milestones, and start believing in the long-term goal of ending oil use because the oil pipeline protests are literally doing nothing. Calling the Koch brothers evil and saying “Exxon knew” is not doing anything to stop the use of oil. It simply is not. Don’t be mad at me for saying it, join me and help me fix it. I have laid out again and again the reasons why we need to switch to a hydrogen powered society, and as I get older I know I’m running out of time so I’m getting straight to the point. 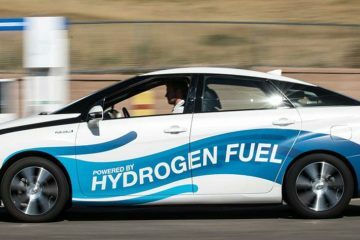 Hydrogen can be made from anything which is why making hydrogen can eliminate landfills, eliminate conventional sewage treatment, eliminate animal waste issues at factory farms, and use all that waste that pollutes our environment by turning it into hydrogen fuel for our homes, cars, and trucks. It’s truly a win-win-win in our quest to eliminate crude oil from the picture and it creates really good high paying jobs along the way. It’s not going to be easy, but it’s a plan that will work. It took generations to build the oil, gasoline, & diesel infrastructure and the trappings we’re subjected to now. It’s going take a long time and a lot of dedication to journey this path, but it is the way, the light, and the truth. 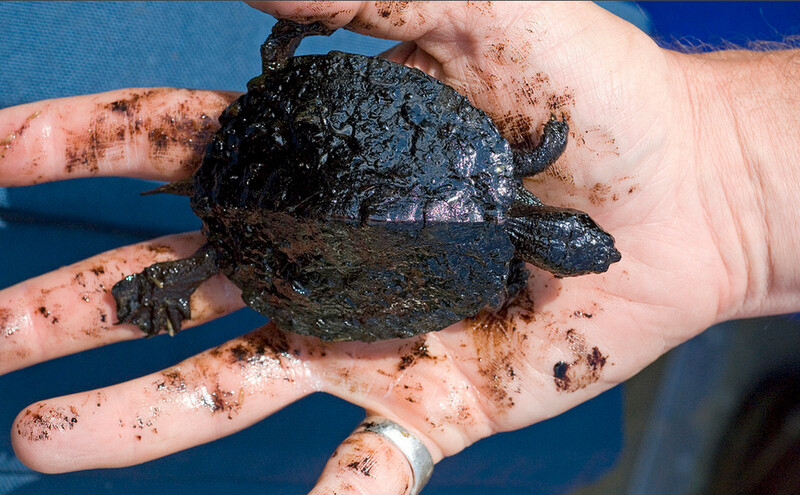 This is a turtle pulled from the Kalamazoo River after the Enbridge Line 6B oil spill. Want to help little guys like this? Oil pipeline protests will do nothing to help him. Support Hydrogen Fuel Cell Electric vehicles and you can end the threat of oil to water once and for all. Look, here’s the bottom line: as long as we use internal combustion engines for transportation, oil is going to flow & be stored in tanks that threaten our ground water. This is a fact. That means that even if #Line5 is shut down, the same amount of oil is going to flow from Superior, Wisconsin to Sarnia, Canada. Let me reiterate that last point again for my friends protesting #Line5, even if #Line5 is shut down, it will NOT stop the flow of oil that threatens our Great Lakes, the oil will still flow by other means as long as there is demand. Even if construction of #DAPL were to be stopped, the oil would still flow by railcar to its intended destination and statistically would put groundwater at an elevated risk of contamination vs pipeline. It’s simple, if you truly want to stop the use of oil, you need to support #Hydrogen fuel cell vehicles. Respectmyplanet.org is Michigan’s Fuel Cell authority and every post here is dedicated to protecting our fresh water resources. Our mission is to protect freshwater and therefore by default, RMP is a staunch advocate of the #HydrogenSociety and #FuelCells. By building the infrastructure necessary to power our homes, hospitals, hotels, factories, churches, cars, trucks, trains, busses, and everything with hydrogen fuel cells, we can eliminate oil pipelines. It’s not going to be easy, but protesting pipelines does nothing to stop the flow of oil. Even if construction of a new oil pipeline is stopped because of a big enough protest or public backlash, the oil will still get from point A to point B by some other means: truck, railcar, or boat. This is a fact. Don’t hate the messenger. Just look at yourself in the mirror and ask yourself honestly if anything I wrote in this post is untrue. Think about it well and you will know what I say is true. Help RMP if you really want to end all oil pipelines. Click on that little donation button in the upper right hand corner of your screen and make a tax deductible donation to our Michigan based 501(c)3. Or, you can click here to make a tax deductible donation. Thanks.